You may have noticed that, as of yesterday, Rifftides looks different and, I think, better. 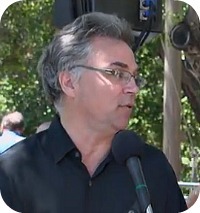 The clean, crisp, spacious redesign is by artsjournal.com commander-in-chief Doug McLennan (pictured), who is making similar changes to all or most of the blogs under the artsjournal umbrella. You may see further examples of his handiwork by going to the AJ home page, which has connections to an array of weblogs concerned with music, theatre, literature, dance, the visual arts and all manner of cultural interests. One slight change to keep in mind; links in comments from readers now appear in boldface black. They turn blue and active when you touch them with your cursor. One of the great things about the new design is that it’s responsivethat is, it shrinks to fit tablets and smart phones. Pretty great reading on the smaller devices, actually. Check it out. I’ve been meaning to tell you how much I enjoy Poodie James. Like all your writing, it stirs emotions and thoughts. I like the new format. It’s cleaner and, seemingly, more concise. Looks good, but have “eyes” for darker type face. Also, have kindled Desmond and renewed interest in same. Doug, love the new format. It appears far more spacious and to my eyes at least, easier to read.. The new site design is very clean and modern looking – but honestly Doug, as some others have already pointed out, a heavier font is needed. Please get Commander-in-Chief McLennan to hit that font button! It’s taken me a while to drum up the courage to write – I dislike being negative but I have to say my piece. To me, the site now looks so austere; it totally lacks the “cozy” feeling that it always seemed to have when I dropped by to visit. Okay, the faint font seems to have been corrected now, and that’s a good plus. But now the site reminds me of two American daily newspapers that I regularly visit that also looked so much more “friendly” not so long ago – The New York Times and The Los Angeles Times. “New” is not necessarily better. And to quote that horrible cliché, “if it ain’t broke, don’t fix it”.